When you're trying to keep on schedule for that important event in your organization, you might want to consider using equipment rental software to efficiently set up the entire process. In addition, trying to run your own rental business can at times be overwhelming if you lack the tools. Nonetheless, here at EquipCalendar, we provide our customers with plenty of software tracking tools to get the job done effortlessly. For any person, or business, that has ever tried to plan out a event or party, they surely have already experienced all the stress that can go along with it. In addition, if you're in the business as an event planner, your job is to ensure that everything pertaining to the upcoming event will function properly. However, trying to ensure that you don't overbook your inventory could become very difficult to manage on your own. With that in mind, many companies are now turning their focus to setting up proper software to help them keep track of everything. However, trying to find a proper service provider to help you start the tracking process could at times become stressful. 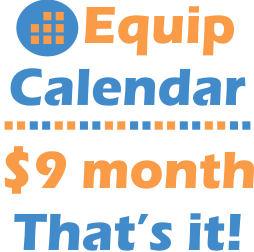 Here at EquipCalendar, we provide simple equipment tracking and calendaring tools to cater to a variety of businesses. This can be extremely beneficial, especially when you're first starting out in your business, and trying to already build up a client base. For those in the rental of equipment for events such as weddings, you're going to be responsible for telling your clients when they can expect your equipment (and their rentals) to arrive. While some companies in the beginning could perhaps track these details on their own while only having a few clients, trying to track every aspect for many clients can become very difficult very fast. When it comes to tracking your inventory, and when it is going to be made available for the next clients event could be costly, if you're not certain on where your inventory actually is at. Setting up the proper equipment rental software in advance could end this disaster from costing your company sales. Selecting the right type of software that can provide you with a list of all your inventory on daily, weekly, or even hourly basis is crucial. When it comes to renting out equipment to the public, you have to be certain what your expenses will be. If, you don't know this aspect at all times, you could end up losing money along the way. With that said, you also need to be certain that all of your employees understand the prices your company charges continuously, which is yet another great benefit to using equipment rental software to help ensure that everyone in your own organization is properly informed at all times. This can be especially helpful for those companies that handle large rental events simultaneously. When it comes to using equipment rental software for your business, at times selecting the right one could be very confusing to begin with. However, taking the time to research all of the available options open to you could prove to be beneficial to the future of your business.